Many people are very surprised to learn that Scarlet Pimpernel is a member of the Primrose family (Primulaceae) - as indeed are also the Yellow Pimpernel Lysimachia nemorum and its close relative CreepingJenny Lysimachia nummularia. This low-growing annual wildflower has square stems, and its oval pointed leaves are black-dotted underneath. 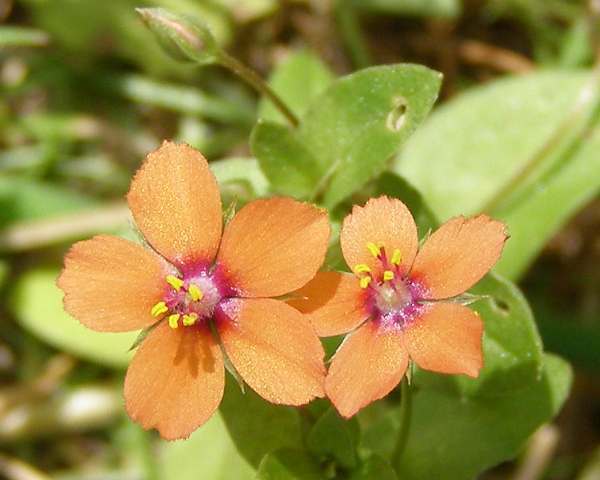 The flowers of Scarlet Pimpernel, which are rarely more than 10 to 12mm across and have five sepals (commonly referred to as the petals), open in mid morning, but they close again long before the sun begins to set. Occasionally you may come across blue-petalled variants of this lovely little wildflower; once in a while we encounter both colour forms growing together (but the two flower colours are always on separate plants). 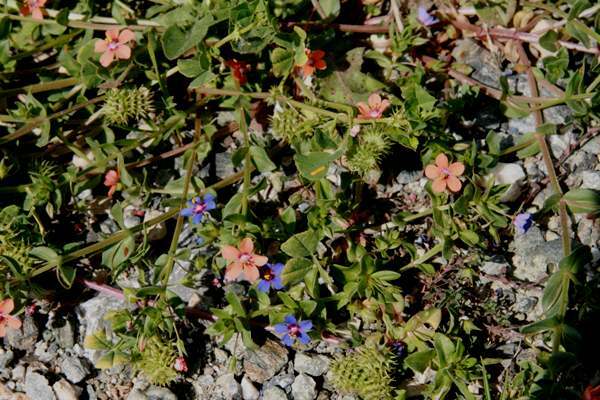 In June 2014 during a visit to Slovenia we came across plenty of Scarlet Pimpernel (brick red form) lining the verges of a main road, and among these prolific conventional plants were numerous with pale mauve flowers. These were not fading red or blue flowers, as several were seen at the bud stage as well as many more in their prime. Other colour forms although seen rather infrequently include maroon, flesh pink, and lilac. Scarlet Pimpernel occurs throughout Britain and Ireland and is a very common wildflower - often referred to as a 'weed of cultivation' because it appears most often in farmed fields and gardens and on disturbed wasteland. Even some World War II bomb sites became colonised by this plant. Well drained, sandy places are the favoured habitat of this lovely little flower, which thrives in cultivated soil. 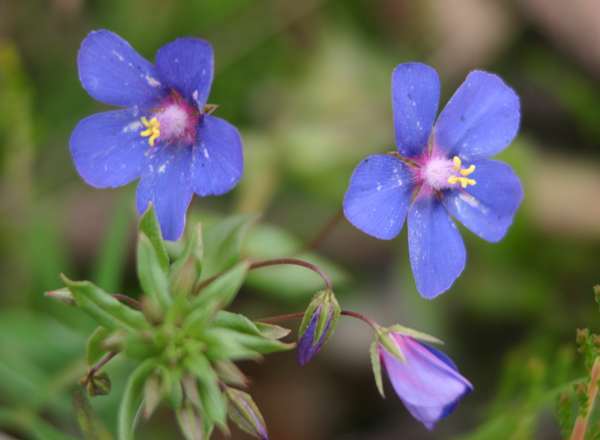 We have also seen Scarlet Pimpernel growing in sandy meadows beside spate rivers in Wales. 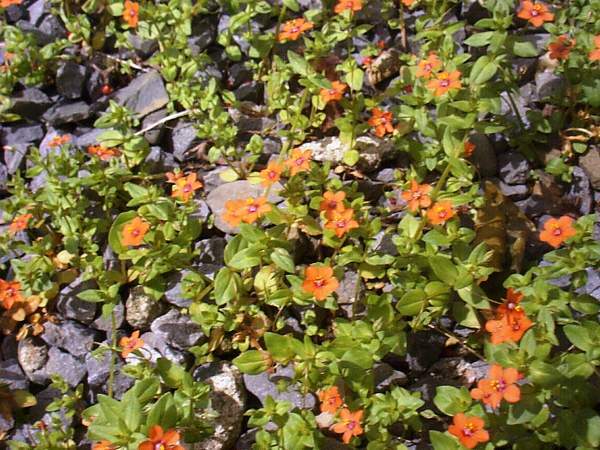 In Britain and Ireland Scarlet Pimpernel can be found in flower from May right through to the end of October, but it is usually at its best in June, July and August. The genus name Anagallis comes from Greek and means 'to delight again' - a reference to the reopening of the flowers each day when the sun comes out. The specific epithet arvensis means 'of cultivated land', which habitat is indeed commonly graced by these lovely little wildflowers. In old Herbals dating back to the 16th century, Scarlet Pimpernel was used for many dubious purposes both cosmetic (as a skin cream) and medicinal, including to produce potions for countering the effects of being bitten by mad dogs. 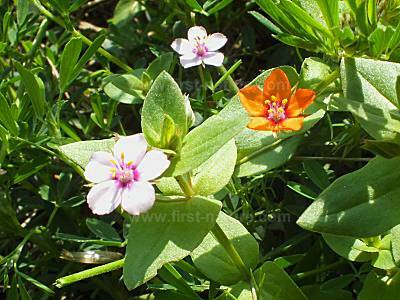 Anagallis monelli, commonly known as Shrubby Pimpernel, is a perennial wildflower of the Mediterranean region; its flowers are larger than those of Anagallis arvensis and its stems are much more woody.